I spent some time studying Grace's bookshelves this week, trying to decide just which book to write about in this month's column. It's no secret that Grace loves when we read to her, so she has quite the collection. Books of every shape and size grace her shelves, and right now, some of her favorites are board books that she can turn the pages. Some weeks, we shuffle through a variety of books each night before bed, and other times, we read the same favorites over and over and over again. For the most part, Grace is content to lay next to you and just enjoy the story. As I looked through a stack of books waiting to be put back on her bookshelves, I found one called "The Lion and the Little Red Bird," both written and illustrated by Elisa Kleven, who lives in California. This book is one given to Grace before she was even born by a former copy editor at the newspaper, Betsy Fingerle. Just before Grace arrived, she and her family moved out of state, but she gave Grace a gift of several books that were always favorites of her children. I had never come across any of these titles before, but they are all fabulous, and have been read over and over and over again. In this particular story, a red bird happens upon a lion with a bushy green tail, as green as the forest. The bird is intrigued, and just looking at the bright green tail makes her very happy. Determined to find out what makes the lion's tail so green, the bird follows him and asks, but the lion doesn't understand the bird's language. He simply hears chirping, and smiles at the bird, enjoying its company. Throughout the day, the bird follows the lion, as it wanders down to a field of orange flowers, chases butterflies and ends up home at his cave for the night. The bird wanted to see the lion's green tail again, so she made herself a bed in a tree nearby, waiting for the lion to emerge from his cave. However, in the morning, the lion's tail isn't green anymore, it's orange. And once again the bird is intrigued. She asks him how his tail changed from green to orange, but the lion simply smiles. For several days this continues, as the lion's tail changes to blue and to red, and the bird continues to follow the lion and asks the same question every day. "The lion just smiled, thinking how much he liked the chirping bird's company." One day, the lion steps on a thorn, and the bird helps him pull it out. Another night, a storm comes, and the lion comes out of his cave to rescue the bird in its nest and bring him into the warm and cozy cave. Once inside the cave, the bird discovers that the lion has painted pictures on the walls of his cave, using his tail in a variety of colors. That night, he dipped his tail into a bowl of shiny red berry juice and painted a picture of the bird. "The bird sang while the lion painted. She sang a song without any questions, full of color and joy. The lion had never heard anything so unusual and so pretty. Just listening made him happy." So often, we let our differences come between us. We think that just because we can't communicate with someone, it means we can't get to know them. The best part of this story is that the two main characters embrace their difference and learn to be there for each other in good times and in bad times, no matter their differences. Some days it's hard as parents of a non-verbal child. Grace can't tell me what she wants or what she needs. She can't tell me what she wants to eat for lunch or even what shirt she wants to wear. However, she can show me when she's happy, and believe me, she finds a way to let me know when she's unhappy. 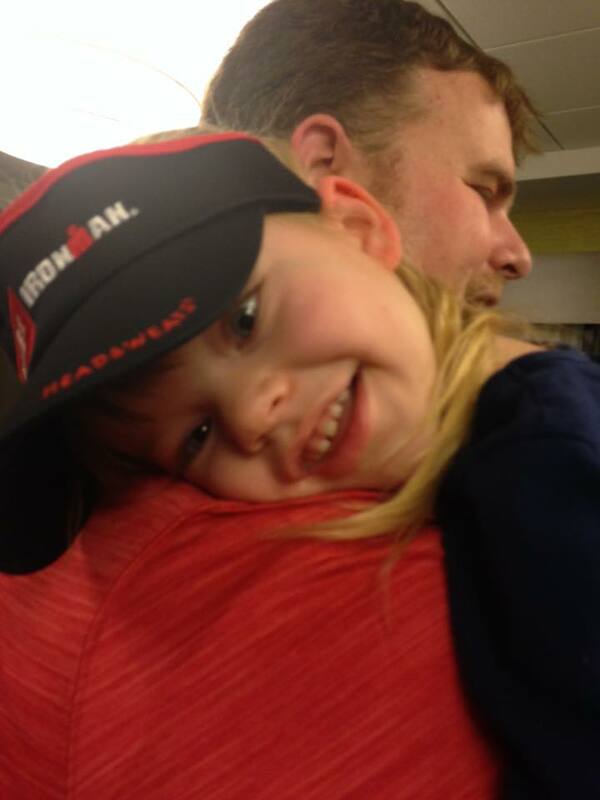 It's that same smile that communicates Grace's love for us and for those she meets. We may not all speak the same language or share the same religious beliefs, but we can all get behind the common language of kindness and compassion, and above all, loving one another. I may never get to hear Grace say, "I love you, mommy," but when her blue eyes light up her face with the biggest smile you've ever seen, I already know. If we can all find kindness like the lion and the little red bird, well, the world would certainly be a happier place. Life gives us opportunities. 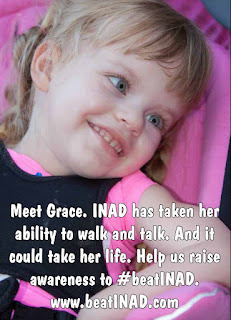 When Grace was diagnosed with Infantile Neuroaxonal Dystrophy (INAD) in November 2014, life gave us the opportunity to make a difference in this world through our quest to cure this terrible disease which may someday take her from us. Life has also given us the opportunity to share our faith and to show a positive outlook, as hard as that may be some times. There are days that aren't 100 percent perfect, but we do our best to try to realize how blessed we are to have Grace in our lives. On Friday night, March 25, we had the chance to meet Lisa Roberts, someone else who has had opportunities showed to her, albeit a different kind. Lisa is a Gillespie grad who then went to SIU-E, before setting in Tucson, AZ after getting her masters from the University of Arizona. She's also a professional Ironman triathlete and one of the top female competitors in the world. For those of you not familiar with triathlons, that's the race that you swim, bike and run further than I usually like to go in a car. It's a grueling test of mental and physical toughness that only a select few even attempt, let alone finish. And Lisa's one of the best at it. Family photo op getting to meet Lisa Roberts the night before Dualthon. She was in town for the Litchfield Duathlon, a run-bike-run event that benefits the Litchfield High School cross country teams. When I got the press release for the race, it mentioned that Lisa would be doing a question and answer session on Friday night during registration pick-up for the event the next day. I immediately thought that this would be a great opportunity for us to give Grace another experience. We like to introduce her to people who have done extraordinary things, especially those with connections to our area. It's a way to get our story out to a new audience, but it also serves as a source of inspiration to me. It reminds me that great things can come if you take chances and take advantage of the opportunities that God gives us. 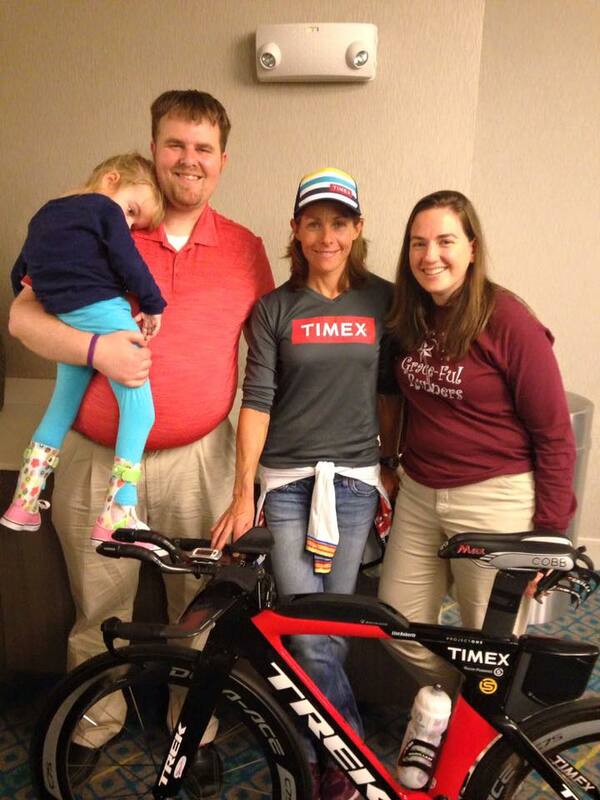 Lisa gave Grace won of her Timex Ironman visors as well! So we made our way over to Litchfield to hear Lisa speak. It was an awesome experience for runners and non-runners alike. 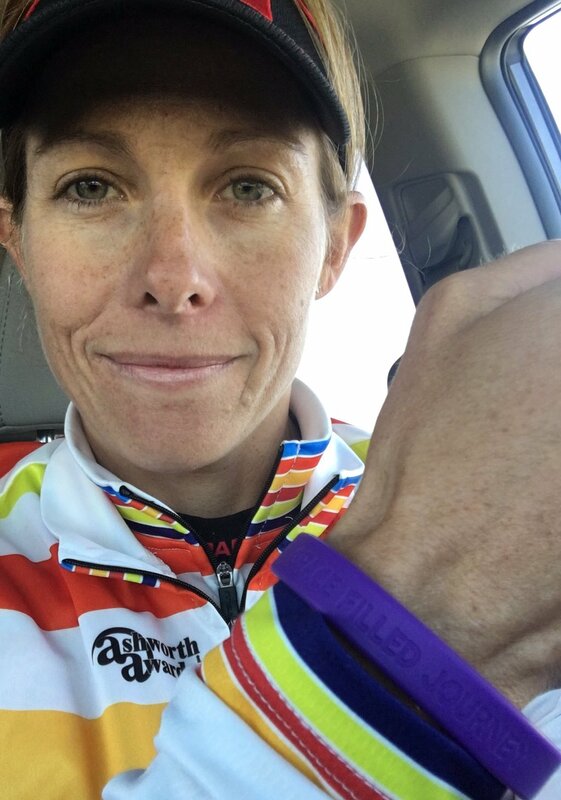 Her dedication to her sport is awe inspiring and it makes me want to continue to do what we do with Grace, which can be just as daunting as the 2.4 mile swim, 112 mile bike ride and 26.2 mile run that comes with every Ironman. What also struck both Mary and I was her willingness and enthusiasm to answer any and all questions. Whether it was a novice looking for a challenge or an experienced triathlete, Lisa seemed to really care about the question and did her best to help out, something not everyone would do. After the Q&A, Mary and I went up to introduce her to Grace. After waiting our turn, I introduced myself (we had briefly corresponded by email when I was doing up some publicity for the race) and Grace. Mary and I told her a little bit about our daughter and our quest to give her as many experiences as possible. We also spoke about Ainsley's Angels of America, which Lisa said she had heard of, and how the group's namesake had INAD just like Grace. Following a photo with Lisa and her bike (which is nicer than about half of the cars I've owned), we gave her a Gracelet and she gave Grace a visor from her sponsor, Timex. It was an awesome evening and one we won't forget. Lisa posed for a photo with us after she was the first to cross the finish line! We kind of thought that would be the end of this particular opportunity, but like many things in life, plans change. With two Easter Egg hunts on our assignment list Saturday, we weren't sure that we would make it to see the race itself, but after Friday night, we made it a priority. We got up early (for us) and made it to Litchfield in plenty of time to see the competitors take off. Again, it was awe inspiring. These athletes weren't doing this for money or stardom. They were doing it to push themselves, to be the best they could be. While we weren't able to stay until the very last person crossed the finish line, we did get to see my Aunt Kim make the transition from the first run to the bike, and we got to see the top finishers stop the clocks. Lisa would be the first one to cross the finish line, beating another racer by less than a few feet, and after she caught her breath, we brought Grace over for another hello. We were touched beyond words when she rolled up her sleeve and showed us that she was wearing her Gracelet for the race. Lisa shared this photo wearing her Gracelet after the race. I'm not sure if we'll get too many more chances to meet up with Lisa, but she'll always part of our Journey now. One of the coolest things about these opportunities for local experiences that reverberate on a national level is that we are able to follow our new friends, even if we may not cross paths again. It's like how we watched Dylan Miller and North Dakota State this basketball season after getting a chance to go down to the Bison locker room. Or how we'll probably watch more Vikings games this year than in every previous year combined after meeting Minnesota lineman Zac Kerin at the Moonlight Y. I've watched the Kona Ironman a handful of times over the years, but I'm sure this year will be different. This year, we will definitely have somebody to root for. 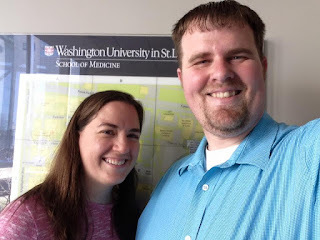 Although this blog is a little belated, this month, Kyle and I went back to school at Washington University in St. Louis. But fortunately for us, we were on the other side of the studying part! Shortly after Grace was diagnosed in November of 2014, her geneticist, Dr. Beth Kozel, asked if we would come and speak at a lecture she was giving to first year medical students at Washington University. The lecture was on the use of the whole exome sequencing test, which was the one used to determine that Grace had INAD. When she first asked us, she wrote, "To become good doctors, students need to learn how to approach conversations like this, and having insight from a family like yours would be wonderful." We were extremely humbled, and anxious to share our story. I keep in touch with Dr. Kozel from time to time by e-mail, and she is now working in Washington D.C. with the National Institute of Health. She's been a really great resource to our family, and even keeps her gracelet in her new office. Over the winter, she e-mailed and said that even though she was out of the area, she would be coming back to St. Louis to give the lecture on the whole exome sequencing test, and asked if we would be willing to speak again. It took us about two seconds to say we would be honored to come back. Selfie at Wash U after we spoke during the lecture. This year's lecture fell on Tuesday, March 15, which just happened to also be primary election day in Illinois. We got up bright and early to be there for the 8:30 a.m. lecture, although we didn't arrive until closer to the time we had to speak at 9:30. There were probably almost twice as many students there this year than last year, and it's a lecture that Kyle and I always enjoy learning more about. Dr. Kozel talks about how families end up in the situation where this test is used, but also talks about the ethics of genetic testing, and how as science and technology advance, it also increases the need for ethical discussions of how it is used. In our particular case, the test looked at all 20,000 of Grace's genes (and ours too), to determine that both Kyle and I had passed on a mutated copy of the gene, PLA2G6, which causes INAD. It's never easy to sit in a doctor's office while they tell you your child is dying, and there's not anything you or anyone else can do to stop it. However, as hard as that day was, I will always remember the compassion Dr. Kozel showed us, and that she told us there would always be hope. Kyle and I enjoy being part of her lecture because it gives us a chance to talk about our experiences and encourage future doctors to have that same compassion and kind bedside manner. To some, Grace may be patient XYZ, but she's our whole world. After we talked for 20 minutes or so, we had a chance to answer student questions, and talk a little bit about our fundraising efforts for the research study, which also happens to be right there at Washington University. When the students were dismissed, we had several stop by to talk to us and thank us for coming and sharing our story. Kyle and I both really feel that it's our honor to be asked, and we are so grateful for the opportunity. 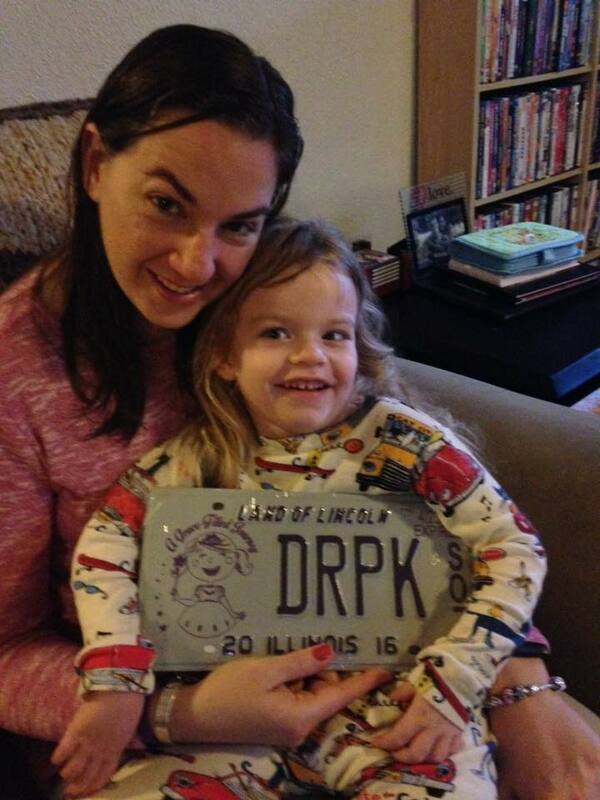 We forgot to take a photo of Dr. Kotzbauer with his plates, but Grace was pretty excited about them. We had one more stop to make before heading for home. As part of the special license plate fundraiser, Kyle and I ordered a set for Dr. Kotzbauer, who is leading the research for treatments for INAD. Since he lives in Missouri, he can't actually put them on his car, but he was delighted to have them, and said he would proudly display them in his office. He gave us a brief update on the study, which continues to make progress and is nearing its one-year anniversary. It seems so hard to believe it's been nearly a year since I collected all the money we had raised to that point and sent $8,000. Now, we have raised over $100,000, and are pleased to be able to continue our efforts to #beatINAD. We have been given so many amazing opportunities on this "Grace-Filled Journey," and we are so grateful to Dr. Kozel and her students for letting us share our story. We know you will all be great doctors someday. 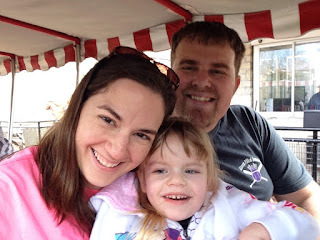 While I've never liked the term "bucket list," Kyle and I do hope to provide a wide variety of experiences for Grace, and we know that we may have a limited chance to do that. 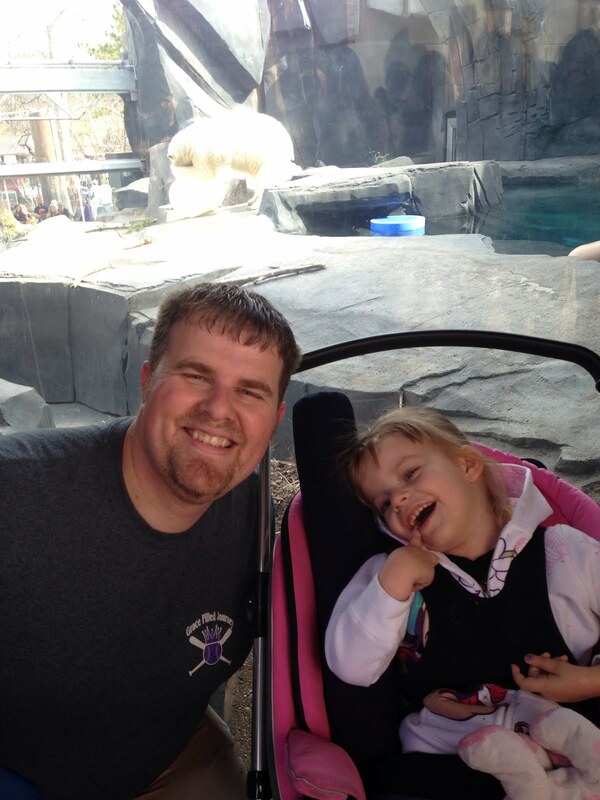 This week, we got to combine a special date night for us, with a fabulous zoo trip for Grace, and it was a win-win for everyone! Date night at the Fox! 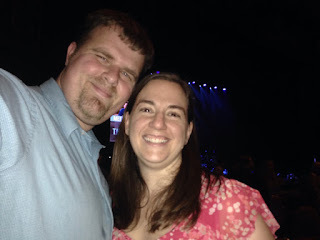 It started with a date night to the Fabulous Fox Theatre in St. Louis to see The Piano Guys on Thursday night. Last summer, Kyle's cousin, Dana, introduced us to The Piano Guys, with a beautiful mash-up of one of our favorite hymns," Amazing Grace" with Rachel Platten's "Fight Song." It almost seemed as it f was written just for our Grace. So, when Kyle found out they were playing the Fox in March, we got tickets to celebrate our seventh wedding anniversary, which was Feb. 28. Although we didn't know much of the music they played, we knew they were talented, and we were anxious to see them in person. Quincy and Grace playing with Grandma Kim. 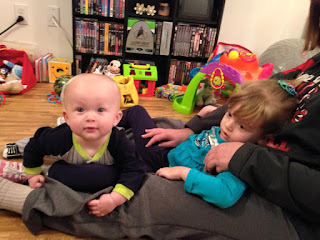 As we started to talk about babysitting options, Kyle suggested we ask his sister to watch Grace at her house in Arnold (just south of St. Louis), and then spend the night at their house after our date. We hadn't seen Scott, Mikaela and Quincy for awhile, and it would be fun to hang out. Mikaela quickly said she would love to watch Grace that night, and everything was set in motion. We even started hoping for some nice spring weather on Friday to take the kids to the zoo, which is one of our favorite places! Grace and Quincy hanging out! Grace loves her new Gryffindor shirt from Universal Studios! We left on Thursday afternoon, and Grace enjoyed watching Frozen in the car on the drive. She even fell asleep for part of the trip. 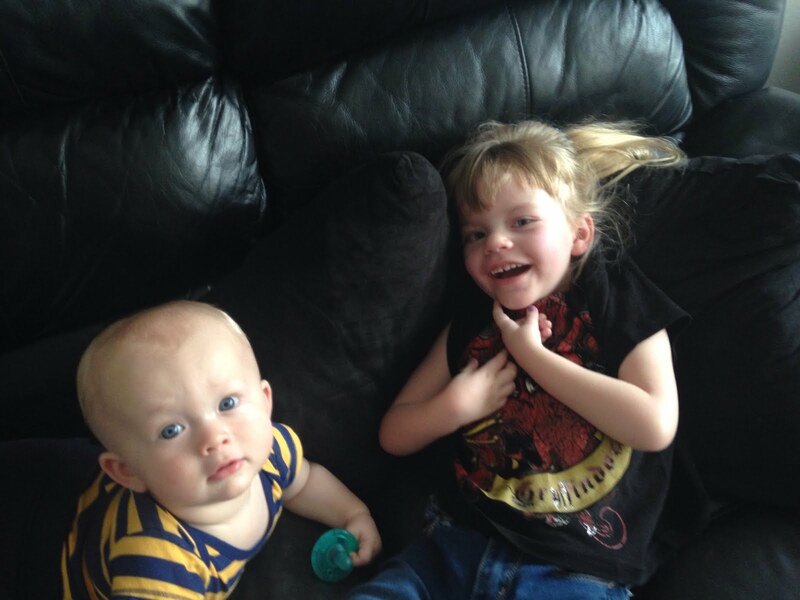 When we arrived in Arnold, Grandma Kim was there playing with Quincy, and Grace was excited to see them both. After feeding Grace, Kyle and I headed out for the show. We grabbed a bite to eat on the way. It wasn't exactly gourmet dining, but we just enjoyed the chance to be together. Heavy traffic and trouble finding a place to park made us about 15 or 20 minutes late to the show, but we were already caught up in the music moments after we walked in. While one played a grand piano, another played a cello (one of 24 he owns). And the music was fantastic, but their stories were even better. They shared that The Piano Guys got started when their now producer owned a piano shop and wanted to explore using videos on social media to boost his business. Although they never sold any pianos, The Piano Guys has taken off to international success. One of their goals is to play their music at each of the seven wonders of the modern world, and they showed videos of playing at both the Great Wall of China and the Christ the Redeemer statue in Brazil. They often blend classical music or familiar hymns with modern day music, like Adele. At intermission, we were so excited to see one of Grace's physical therapists from Springfield, who was also at the show. She came over to see us, and we talked about how great the music was. The show was nearing its end, and we still hadn't gotten to hear Amazing Grace/Fight Song. Kyle was afraid that maybe we missed it when we were late to the show. But, we were in luck, as they began to introduce the last song, we kind of guessed that was it. They talked about they were big fans of superheroes, but not in the Superman sense. Rather, they thought superheroes were those fighting cancer and other battles so bravely all the time. They talked about grace and hope, and it seemed like it they were talking exactly about our Grace. I felt the tears roll down my cheeks as they played their mash-up of songs and thought about just how brave and courageous that our Grace really is. We had hoped for a chance to meet The Piano Guys in person after the show, but it didn't work out. 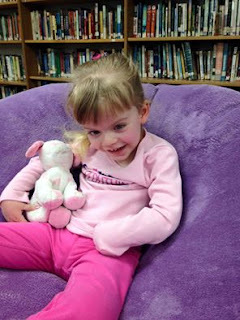 We wanted to share Grace's story with them, but it wasn't meant to be. We will hope to see them again and have another chance to tell them about Grace. It was nice after the concert to only have the short drive to Arnold, where Grace was sound asleep. She put up a pretty good fight for Aunt Mikaela, but fell asleep anyway. And we were asleep shortly thereafter as well. 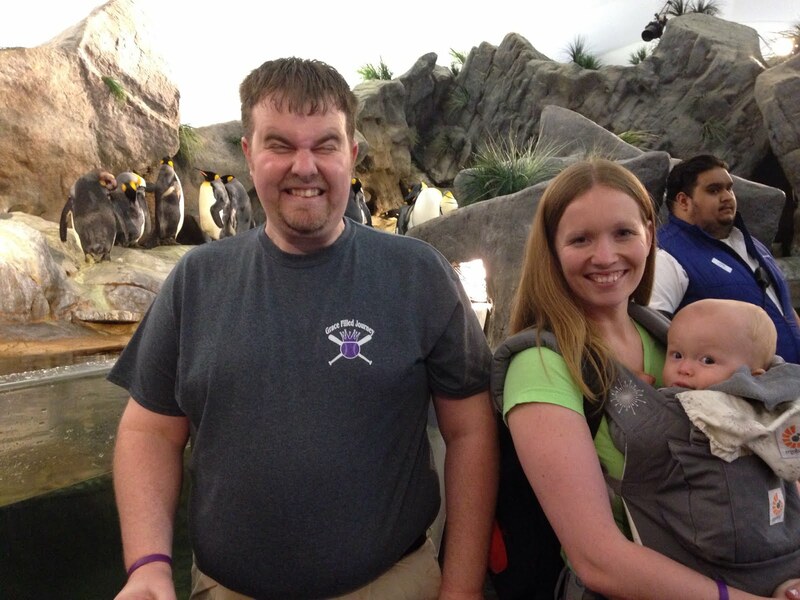 Just hanging out with the penguins. The next morning, we awoke very excited to see at least a partly sunny sky, which meant a trip to the zoo. Uncle Scott had to work, but the rest of us enjoyed our morning and lunch at McAllister's before heading to the zoo. Hanging out with daddy and Kali the polar bear. Grace LOVED when Kali swam by her stroller. The weather was just perfect as we arrived at the zoo, and we headed straight to meet the new polar bear. 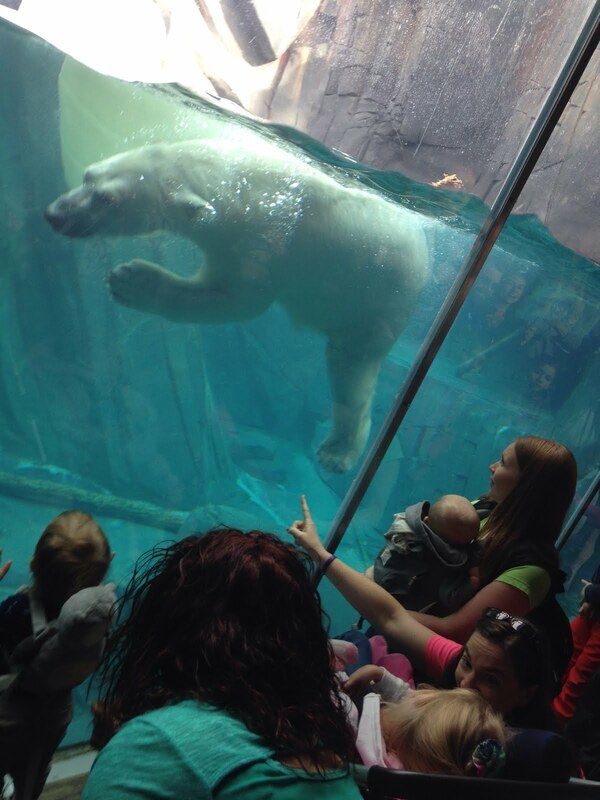 Kyle has wanted to see him ever since they finished the new habitat last summer. Kali was busy playing with a large plastic barrel in the water, and Grace giggled and giggled every time he swam past her. Oh, you know . . . just monkeying around. 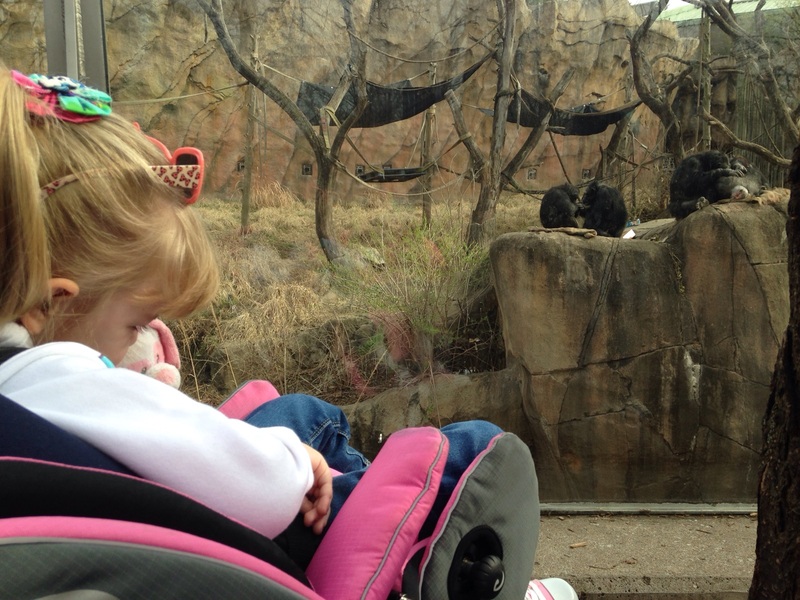 Another of her favorite parts was a trip on the zoo train, and she laughed every time the wind caught her breath. We also checked out the penguins, the big cats, the monkeys and just had so much fun walking around the zoo on a pretty spring day and visiting with each other. All smiles waiting for the train! Family photo op on the train! Everyone loved the train ride! All too soon, Grace was getting awfully tired, and we decided we should probably head for home. Tired though she was, she managed to keep herself up the entire ride home, watching Frozen. All in all, it was just another great couple of days on this Grace-Filled Journey. As we rang in the new year in 2016, Kyle and I talked about some of our goals for the upcoming year. Our friends, family and community had been SO generous in helping us to raise funds for INAD research over the past year, which allowed us to further help the study at Washington University. To date, around $100,000 has been given to the study in honor of Grace, which is nothing short of amazing. Celebrating Rare Disease Day in Springfield. This year, we decided we would continue to raise funds, even if we weren't able to raise as much. 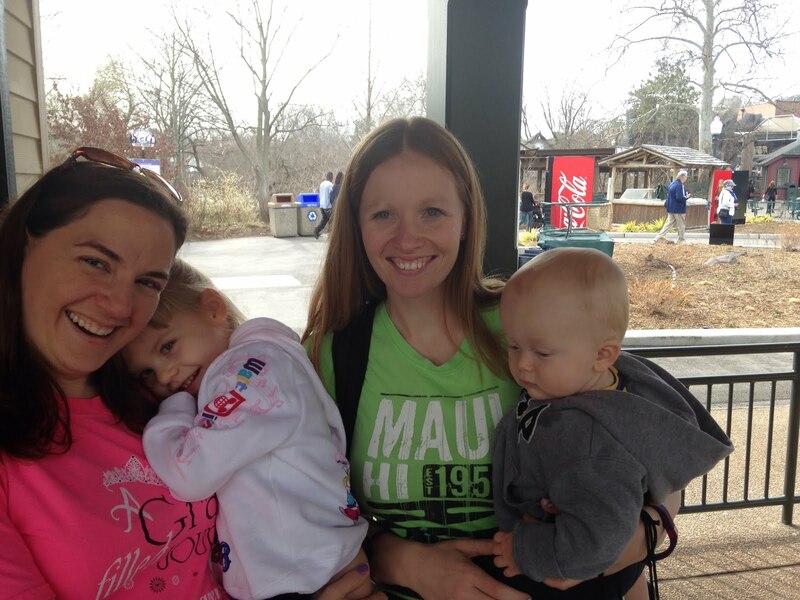 Fundraisers of all kinds abound, though, and our community continues to blow us away. But in addition to raising funds, we made it a big goal of ours this year to really help spread awareness about INAD in all corners of the world. With less than 50 children affected with this devastating disease all over the world, that makes the job even bigger. But we will not be deterred from sharing our story and making sure everyone knows what it means for a child to suffer from INAD. Our friend, Linsday, came to the rescue and helped us when we were lost! And sometimes, along the way, you meet people who really step up and help you in your endeavors. Meet Illinois State Representative Avery Bourne, who has been serving our district since last year. Ever since hearing our story, she has worn a purple gracelet, and been one of Grace's biggest fans. Oh, just sitting in the House Gallery. 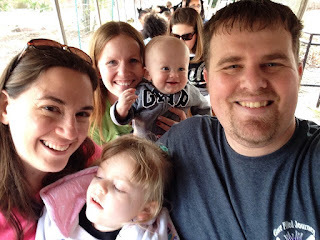 Earlier this year, Kyle and I talked about the possibility of asking our mayor or the county board chairman about signing a proclamation in honor of Rare Disease Day in September. Since you miss 100 percent of the shots you don't take, we opted to ask our state representative about a resolution in Grace's honor. She loved the idea, and it turned out even more fabulous than we ever could have imagined. State Representative Bourne kept us up-to-date throughout the process, which started when the resolution was filed. Eventually, another sponsor was added to the resolution, and we were invited to the Capital in Springfield on Wednesday, March 2, where the resolution would actually be read on the House floor during session. Talk about ecstatic. It was all we could ever have hoped for. LOVE this photo of Grace with State Representative Avery Bourne. The resolution was read in committee in the morning before we arrived, where it passed unanimously. Ms. Bourne wore a purple dress in honor of Grace, and talked some of her colleagues into wearing purple to the committee meeting as well. She said several of her fellow legislators have asked about her purple gracelet, and were excited to see Grace at the Capital that day. Grace played hooky from school that morning, and we headed up to Springfield, where we met with Grandma and Grandpa Galer, who were also able to come up for the resolution. Although we initially had some trouble with parking and finding our way to the gallery, our friend Lindsay came to the rescue, and made sure we got to the right place. Shortly after we arrived, Ms. Bourne came to meet us in the gallery, where she had all sorts of things for Grace, including a proclamation in honor of Rare Disease Day, signed by Governor Bruce Rauner and Secretary of State Jesse White, as well as a very special letter from the governor. After the resolution was read on the House floor, she also brought us a signed copy of that as well. This was my favorite photo from the experience. Kyle and I have never really been "in the spotlight" kinds of people. That's why journalism is such a great fit for us. We are called to be the observers in the room, the ones who tell the story. So "being" the story is something that's a step out of our comfort zone. But I can't tell you how proud I was of Grace as we stood up in the House gallery as the resolution was read. Family photo in the Governor's office. Afterward, Ms. Bourne invited us to take Grace's photo in the governor's office. He wasn't in, but we took a photo of Grace just the same, and posed for a few other photos in the Capital as well. Then, all too soon, it was time to head for home, and back to reality. It was a paper day after all. Cheesing with Grandma and Grandpa Galer. 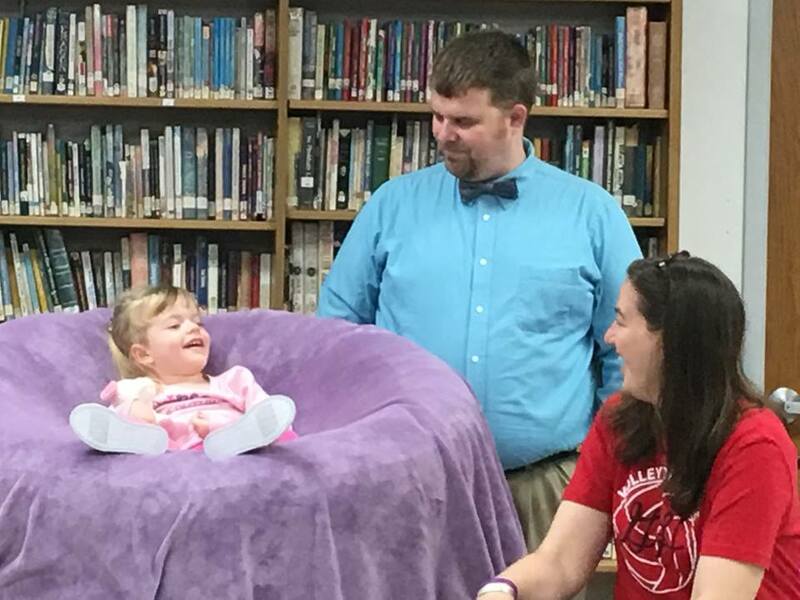 Kyle and I are so grateful to State Representative Bourne and all the legislators who helped us make this a reality, and really have a chance to raise more awareness for INAD. Until there is a treatment or a cure for INAD, we will continue to be Grace's voice, and a voice for all those who suffer from this devastating disease. With your continued love and support, we will #beatINAD. While the rest of the world celebrated Leap Day on Feb. 29, 2016, the Herschelman family celebrated Rare Disease Day, a worldwide effort to raise awareness about all kinds of rare diseases. And since INAD has less than 50 known cases in the entire world, we consider that to be pretty rare! 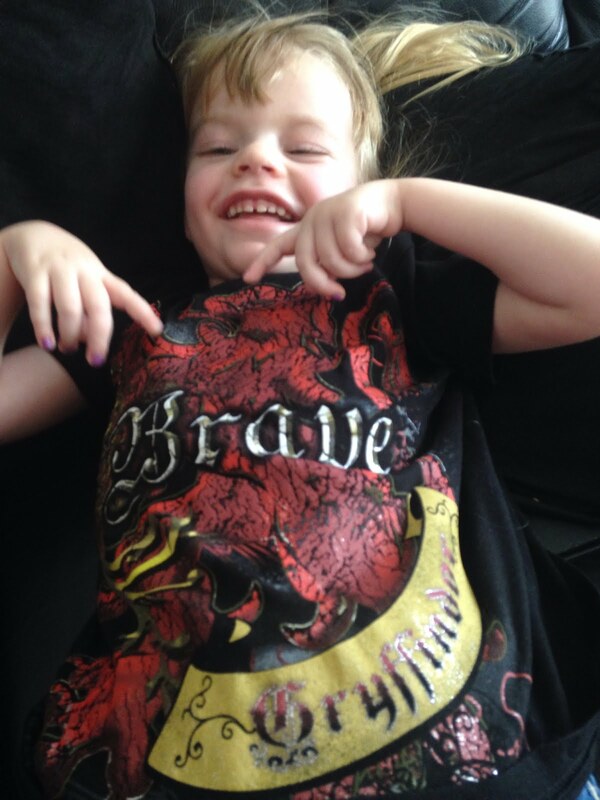 This is the photo we used to raise awareness for Rare Disease Day. We started our day with a beautiful drive to Morrisonville about 30 miles from our home. 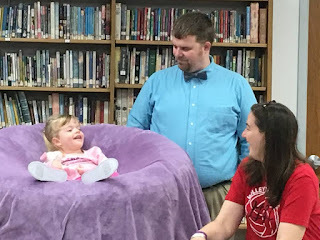 Thanks to science teacher Janet Walch, Grace is considered a celebrity all across the Morrisonville School District. I think it's safe to say students and teachers there have adopted our "Grace-Filled Journey" wholeheartedly. Grace and I loved all the signs with her photo around the school. Mrs. Walch first invited us to speak to her high school science students last winter when they were studying genetics. At a basketball game earlier this year, she asked if we would consider coming back once again in February, and we of course, agreed. It's safe to say that Grace LOVES to be the center of attention. After parking in the circle lot (and remembering to close the door of the van this year - thanks, Janet), we walked in the front door to find all kinds of signs and notes with Grace's photo on them. It's very evident how much she is loved there, and we felt so honored to be invited back. Grace really enjoyed being part of the program. We got Grace situated in her purple throne where everyone could see her, and the students came in. Initially, it was going to be just the high school science students, but the seventh graders won the right to come when they won the penny wars, and the eighth graders begged to join too, so it was a full house. Janet introduced us and asked us to share about any updates in Grace's condition or progress in the medical research studies. The seventh graders earned the chance to get their picture taken with Grace for winning the penny wars. As I began to talk, Grace immediately started babbling herself, and then just grinned at all the students. It was the best part of my day, as I felt like she decided she wanted to tell her story instead. I waited for her to finish, and I continued talking, although Grace was definitely winning all the attention with her smiles. We are so grateful for the students' enthusiasm and their great questions about Grace and genetics. I'm not super science-minded, but I have learned so much about genetics in the last few years. As we wrapped up the presentation, the students had a few gifts for Grace. Her favorites were of course the three brightly colored balloons, but they also gave her a giant bag of M&Ms, purple fingernail polish and St. Louis Cardinals temporary tattoos. Oh, and they also had a check for $1,100 for INAD research. Yup, you read that right. They held a penny wars leading up to our visit, which is just amazing. Grace was all smiles getting to play with her new balloon. Before leaving, the seventh graders earned the chance to get their picture taken with Grace for the paper, and we had a chance to talk with some of the students. One young lady told us she was going to talk with the Student Council at a neighboring school and see if they would be interested in joining our "Grace-Filled Journey." Another student, told us she was so excited to hear that the study was at Washington University, because she knew personally what a great institution it was. The students' enthusiasm and encouragement is so uplifting to us. I told them that someday, there would be no more INAD. We know that a cure might not come in Grace's lifetime, but we hope that someday, other families may not have to fight this awful disease. And I told the students, they were part of that journey. Someday, when INAD is no more, they can be proud it's something they were a part of. Grace got to talk to Janet Walch before we left for the morning. 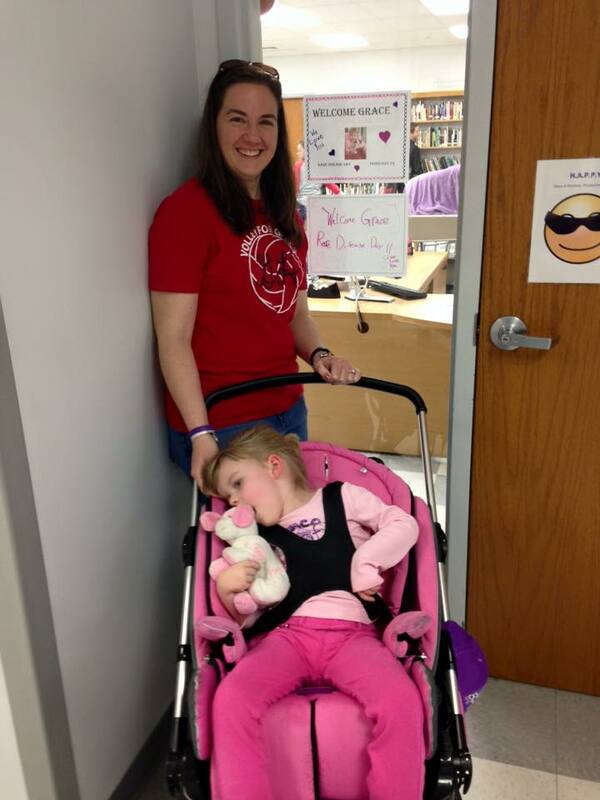 All too soon, it was time to return home, and talk about our plans for the rest of Rare Disease Day. We enlisted the help of other INAD families for a social media campaign using #beatINAD. Our goal was to get trending on social media sites like Facebook and Twitter. And while we didn't quite make that, Grace's post alone reached more than 20,000 people and had nearly 600 shares. It even got retweeted on Twitter by Bob Crawford of the Avett Brothers band, which was the highlight of the day for us. Although Rare Disease Day has come and gone, we will NEVER stop our efforts to raise awareness and financial support to #beatINAD.